78th Birthday Special On Yoodleeyoo Radio. Do not forget to tune in. Click on the following link and your music player will open to the world of music with Kishore Kumar. 10.00 P.M. Dj Don goes online with his selection of Kishore Kumar Songs followed by Harihar, who are our two great music fans who will entertain with the very best of Kishore Kumar. This entry was posted on Saturday, August 4th, 2007 at 9:06 am	and is filed under Specials. You can follow any responses to this entry through the RSS 2.0 feed. You can skip to the end and leave a response. Pinging is currently not allowed. how can I run .PLS file? Bohot achhe bajate raho hum sunrela! 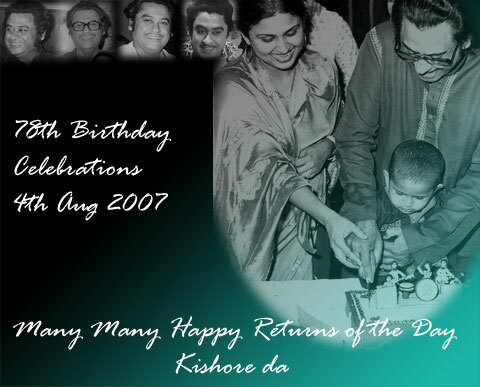 kishore da happy birth day. but m nervous to see the responce to the site. I have very special memorable thing with KK. In January 1985 @ aurangabad (Maharashtra) I met him. The day before he has some problem with local journalist.Thats why when I went to meet he gave me one paper chit , and in that chit he wrote”Aaj mera moun vrat hai”. Then I also gave him a chit and asked then how will u sing in the evening programme. Then again he wrote ‘mera moun suryast tak hi hai!’This incidently Pancham and Leena were watching. They started laughing and they told KK ‘Dada ye journalist nahin hain ye tumhara fan hai’Kishorda immidiately start talking and next 45 minutes were memorable for me.